Detects both GFP and YFP by Western Blotting. 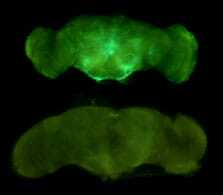 Full length native protein (purified) corresponding to GFP. This antibody was purified by protein G and Ni-NTA nickel affinity chromatography, followed by dialysis against PBS. Our Abpromise guarantee covers the use of ab38689 in the following tested applications. WB 1/4000. Predicted molecular weight: 27 kDa. Immunohistochemistry (Formalin/PFA-fixed paraffin-embedded sections) analysis of mouse skin tissue labelling GFP with ab38689. Tissue was fixed with formaldehyde and blocked with 3% BSA for 0.5 hour at 38°C; antigen retrieval was by heat mediation with a citrate buffer (pH6). Samples were incubated with primary antibody (1/25) for 1 hours at 37°C. 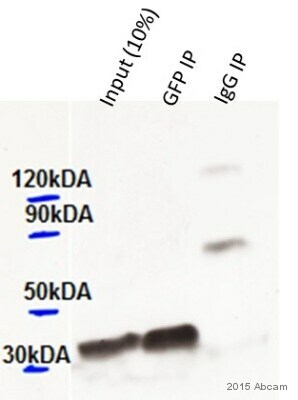 A peroxidase-conjugated goat anti-mouse polyclonal (ready to use) was used as the secondary antibody. -ve shows negative staining of the antibody in a wild type mouse, whereas +ve shows positive staining in a mouse expressing GFP under the LGR5 promoter. Immunohistochemistry (Frozen sections) - Anti-GFP antibody [6AT316] (ab38689)This image is courtesy of an anonymous abreview. Immunohistochemistry (Frozen sections) analysis of E10.5 mouse embryo tissue sections labeling GFP with ab38689 at 1/200 dilution. The tissue was fixed with paraformaldehyde and permeabilized with PBS / 0.5% v/v Triton X-100. The tissue was incubated with ab38689 in 1% BSA + 5% goat serum + PBST for 12 hours at 25°C. 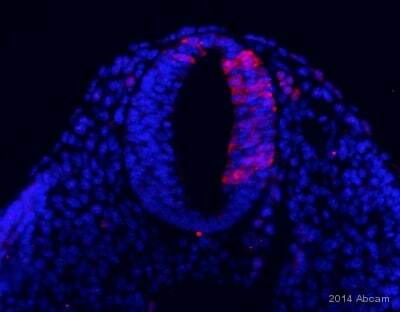 A polyclonal goat anti-mouse Alexa Fluor® 568 secondary antibody was used at 1/1000 dilution. GFP and YFP were expressed in bacteria. 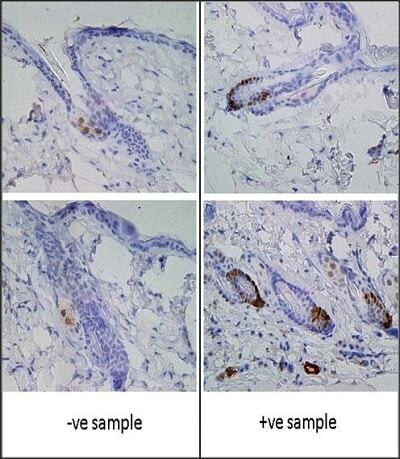 Formalin-fixed and paraffin-embedded human cancer tissue reacted with ab38689, which was peroxidase-conjugated to the secondary antibody, followed by AEC staining. ab38689 staining GFP in Chicken spinal cord tissue sections by Immunohistochemistry (IHC-Fr - frozen sections). Tissue was fixed with paraformaldehyde and blocked with 10% serum for 1 hour at 20°C. Samples were incubated with primary antibody (1/500 in PBS) for 16 hours at 4°C. 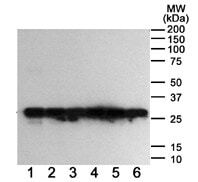 A Cy2®-conjugated Donkey anti-mouse monoclonal (1/100) was used as the secondary antibody. Publishing research using ab38689? Please let us know so that we can cite the reference in this datasheet.